I spent many Summers growing up in the kitchen with my grandmother, baking this and that. I’ve got a lot of cherished memories of morning donuts and cinnamon rolls, afternoon goodies, and all kinds of things in between. I usually get a boxed mix at the grocery store and make chocolate chocolate chip muffins for her to take to school. We started with a normal muffin recipe and choc-la-fied it. Using brown sugar instead of white sugar really punches up the flavor instead of hiding it under the chocolate. You can also get away with using less which saves calories. To make the muffins for devil’s food cake-like, I used the baking powder/vinegar combo which is great for making things fudgy in texture. A final trick I use is to split the chips with some in the muffin and some on top which allows you to use less without sacrificing taste. 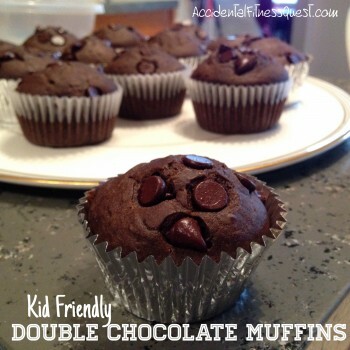 Typical recipes would call for using 1 cup of chocolate chips in the muffins but the flavor doesn’t stand out in an already chocolate muffin base. By putting some inside and a bit more on top, you get the melty chocolate chip flavor right up front and can use 1/3 less. Bonus! Preheat oven to 400 degrees and place 14 paper cupcake liners in a muffin pan. Measure and combine the dry ingredients (through salt) in a large bowl. Make a well in the center and add in the wet ingredients. Mix well. Add 1/3 cup chocolate chips to the batter and stir to combine. Divide the batter into the prepared muffin pan, filling each hole about 2/3 of the way full. Sprinkle the remaining chips on top of each muffin. Bake at 400 degrees for 15 minutes. Remove from oven and cool. Makes 14 muffins at approximately 158 calories each – 3g protein, 23g carbs, and 6g fat. It was pretty cool to give The Kid a lesson in how to modify recipes and substitute a few things as needed. This will come in handy later as she’s learning to navigate her dairy allergy on her own. Needless to say I loved spending time with The Kid in the kitchen and thoughts of my grandmother went through my head as I did it. I hope some day The Kid looks back as happily as I do on days like this. 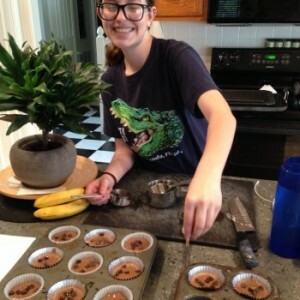 I’m looking forward to more baking adventures this Summer once school is out. What is your favorite baking memory as a child?